Chilliwack's Dan Weatherby takes home the top 2016 prize with a 53-pounder. Sep. 5, 2016 8:00 a.m.
“Oh right on!” were the first words to come out of Dan Weatherby’s mouth when he learned he won the 2016 Port Alberni Salmon Festival with his 53.2-pounder. The Chilliwack resident caught the salmon in his second-ever Salmon Fest entry on Saturday, Sept. 3 near Brady’s Beach in Bamfield. 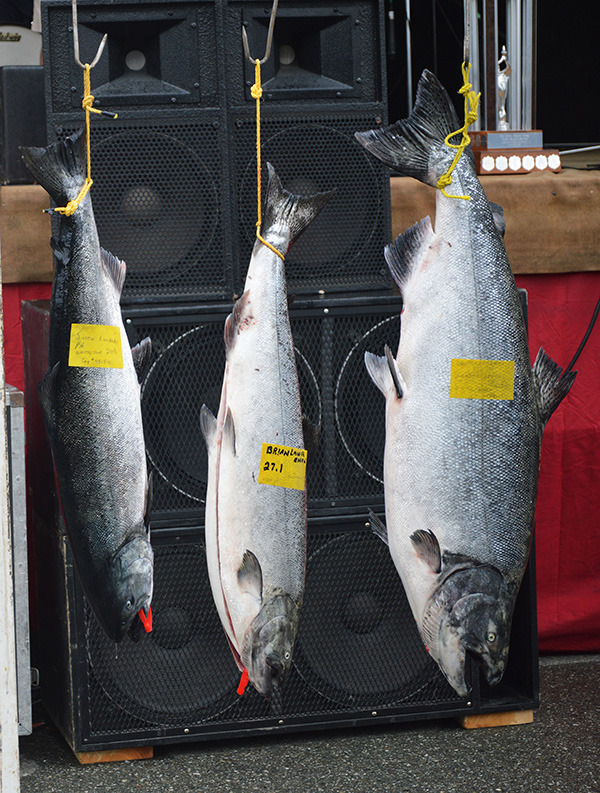 It’s the biggest fish to be caught in the salmon derby since 1991 and the fourth-largest in the festival’s 45-year history. Along with his 11-year-old son Ty and friends Nelson MacMorran and Bruce Tierann, Weatherby wrestled in the 53-pounder (pictured below at right) using a Silver Horde Cookies and Cream spoon lure. “The fight lasted for about half-an-hour. It was the biggest salmon I’ve ever caught,” said Weatherby. They almost lost it in that half-hour fight. “Nels missed it with the net on the first attempt and our hearts almost stopped!” Weatherby said with a laugh. Weatherby, who’s only entered the derby once before, comes out fishing near Port Alberni a few times a year—but hasn’t ever caught a salmon near this size. But while $15,000 and the fame of catching the fourth largest derby winner ever is quite the prize, the best part of the festival for Weatherby was sharing it with his son Ty. “The best thing was that my 11-year-old son Ty was with me so to experience that with him is going to be a lifelong memory for both him and myself,” said Weatherby.